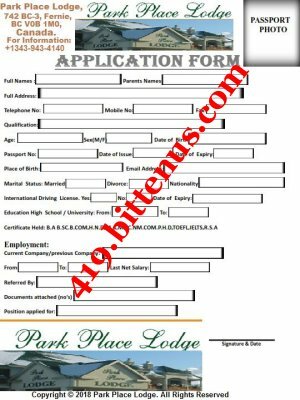 The Park Place Lodge Hotel Canada has received Your CV/Resume has been assessed by our Employment Relations Board and we are glad to inform you that we have found your profile relevant and hence suitable for working with our Hotel. Kindly find the attached Online Interview Questions and Job Application forms, which you are required to print it out, fill carefully, scan and send it back to us your application for the said job may be consider void . You are also required to scan and send copies of your School Certificate, International Passport and Passport size photograph. Note that the company will apply for Visa of any selected candidates on his/her behalf as the hotel management is going to have a legal agreement with the Canada High Commission for Visas for our selected staff outside Canada but Candidates will only responsible for his/her Visa charges in his/her respective Country while the hotel management will offer every selected candidate free Air Ticket, free accommodation. Please follow every instruction, reply to all messages and send all requested documents immediately, as we are having limited time for recruitment.